This weekly program provides parents with safe, loving child-care on Monday, Wednesday, and Friday mornings from 8:45 a.m. – 1:00 p.m. The MOM’s program for 2018-19 is FULL for the school year. Parents can enroll their children for one, two or three days. This program is designed for children who are walking through age three. MOM donation rates and additional information is available from the church office. Please contact the church office for more information on this program at 294-3121. Mid September – May | Wednesdays 3:15 – 5:30 p.m. The Christ Kids program meets mid September through May, from 3:15 – 5:30 p.m. on Wednesday afternoons at the church. The program is open to all children ages four through fifth grade and their friends. Children attending this program enjoy outside recreation, snack time, music, Bible story, crafts and fun times with their friends. For more information, please contact the church office at 294-3121. Each fall all our entering third graders are given a new Good News children’s Bible to help them learn and explore the scriptures. This special presentation takes place during worship in the fall. All 1st-5th grade children are invited to serve as an acolyte for our worship services. Training is held on a regular basis for those children interested in assisting in worship. Contact the church office for information. Every summer, children ages four through 5th grade graduates are invited on an exciting journey through the Word at Vacation Bible School (VBS). VBS is held from in the evenings and offers a wide variety of experiences and opportunities for children to grow in their faith. Children experience exciting new Biblical songs, creative crafts, delicious treats, hands-on Bible stories, interactive movies, and so much more. Contact the church office for this years date and to register children or volunteer. AND don’t forget Sunday School! Mid September – May | Sundays 9:30- 10:30 a.m. FIRST SUNDAY 9:00 a.m.
Our Sunday morning Sunday School is one essential way children are rooted in faith. 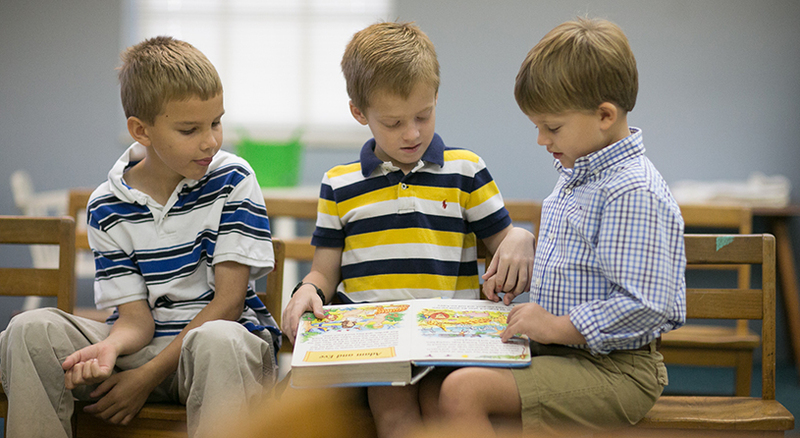 Each morning children, Pre-School through 5th grade are dismissed from Time with Younger Disciples in the Heart of Worship Service (9:15am) or arrive on their own at 9:30am. They learn music with our Music Director, then with their class engage the Biblical story through interactive games, creative crafts and study. On the first Sunday of the month, when First Pres. has one worship service at 10am, Sunday School begins at 9am.